In December last year, I presented the Top Holdings of Dividend ETFs, a virtual portfolio of dividend growth stocks compiled from 27 exchange-traded funds (ETFs) that invest in dividend-paying stocks. In June 2017, I presented an update based on 28 Dividend ETFs. This article repeats the exercise, this time with 32 Dividend ETFs. I present the top 50 holdings along with key statistics and fair value estimates from Morningstar. To compile the virtual portfolio, I analyze the top 25 holdings in each ETF and assign scores proportional to the size of each holding. Summing the scores of individual holdings allow me to rank them by popularity, and so to find the top holdings of these dividend ETFs. Exxon Mobil (XOM) was ranked #2 on the June 2017 list but now is the clear winner. XOM is followed by Procter & Gamble (PG) and Johnson & Johnson (JNJ), which was the top-ranked stock on the June 2017 list. International Business Machines (IBM) appeared in the top 25 holdings of no fewer than 20 dividend ETFs, the most of any stock! Interestingly, Microsoft (MSFT) appeared in only 9 of the top 25's, yet it is ranked higher than IBM. Four stocks moved into the top 10 list: Chevron (CVX), MSFT, IBM, and Wal-Mart Stores (WMT). 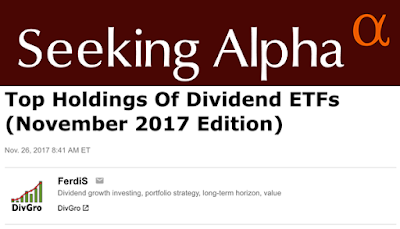 To see the top 50 holdings of dividend ETFs for November 2017, please read this article at Seeking Alpha. Thanks for reading! 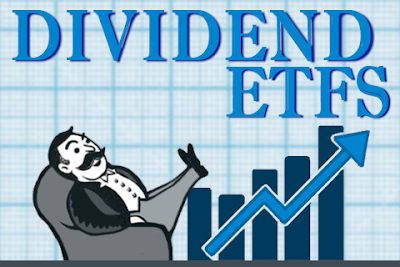 If you liked this article and would like to see regular updates of the Top Holdings of Dividend ETFs, please let me know in the comments below.